Feb 28, 2013 Hi Chiquita, we show that your account was canceled at your request and that we received your return. You were issued a full refund for the return received. Please don't hesitate to contact us back if you need any further assistance. i ordered a bottle of instaflex for a introductory price of $4.99 for a 2 week trial period one week ago and they have billed my card for an additional $75.00 @midnight on the 31st, today. The agreement was to try it and if it works then I can order the product but with my authorization, not because they had my payment info. Never again and I want my money back on my card immediately!!!!!!!! Ironiclly, as I went to the complaint department I found a site that tells people about this happening to others but I had alreasy placed my order and my acct info was already compromised. Review #291458 is a subjective opinion of keetapissed. I had the same experience as this person, did try emailing the address in the response, but got my email message back as underliverable, as this is apparently a fake address. Perhaps you are better to order this from a third-party. 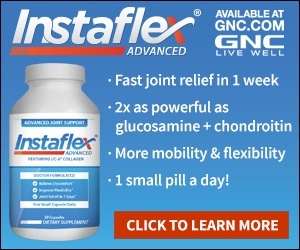 I ordered Instaflex as a trial, they charged $5 for shipping. Once they had my credit card number they took it upon themselves to "enroll" me, send me a second bottle and charge my card 79.68. A phone conversation with customer support and their supervisor was not taken seriously. It's the "Oh well, too bad, guess you didn't read our fine print" speech. Really? I actually would have given this more of a chance if they played fair. Wouldn't want to patronize a company that stoops to this kind of trap. Would you?